Two weekends ago, Milo’s birth mother came to stay with usin Colorado for the first time. We were so excited to show her our home and tospend time together. Payton arrived on Friday afternoon and all three of us wentto pick her up at the airport. She hopped in the back and Milo stared at herintently the entire drive home. At homethey played for a bit in his playroom and then she got to give him a bath forthe first time. I watched them from the door and felt pure joy. Bath-time issomething that I already take for granted because it happens daily. But beingable to see her experience bath-time and to know how special it was for hermade me even more grateful. Milo played and sang and smiled at her the entiretime. After Milo went to bed, we spent the evening catching up andgetting to know each other better over frozen pizza. It still amazes me howmuch we have in common with her and how easy it is to talk with her. We wereable to talk about things that had been on both of our hearts, worries andwonders. It was an evening I will treasure forever. On Saturday we drove down to Denver and visited the Zoo. Wewalked around and looked at all the animals. We saw a sea lion show and Milo loved just watching thewater. He did not even care about the sea lion. Payton got to show him the lions, giraffes, elephants andgorillas. He is starting to recognize other animals and I cannot wait for himto understand more about them. We fed Milo lunch and almost got attacked by crazyterritorial geese who were fighting each other for scraps and trash. I wasterrified. We saw the orangutans who were flying around their playroomlike trapeze artists. The gorilla family was so cute, and the baby gorilla keptreaching up to his dad to be held. After Milo ate, we drove to downtown Denver not realizing itwas St. Patrick’s weekend. It was crazy busy and everything and everyone wasgreen. We showed Payton Union Station and 16th street mall. We wentshopping and made Will and Milo endure H&M and Victoria’s Secret. That evening we grilled chicken and had yummy salads andmore conversation. Payton shared her plans and what she wants to study atschool. Will and I shared our hopes and uncertainties for a big family one day. The next day we had brunch in Lafayette and explored Pearl St. on Boulder. She gave Milo his first taste of chocolate ice cream which he obviously loved. On her last day, I had a doctor’s appointment so she offeredto watch Milo. After almost 8 months of growing our sweet little boy andbringing him into the world, Payton had not had anytime alone with Milo. Shefed him, changed him, and played with him while I was gone and I know that timethey shared together was really special. Open adoption looks different for everyone. Some birth families watch from a far and receive updates through mail or social media. Other birth families have monthly visits and shared vacations with their chosen families. This past year we have been shaping a mold that is changing to fit the needs and wants of everyone. Our open adoption and our relationship with Milo’s birth family will constantly evolve and change as he grows. I am so incredibly grateful for the relationship we have with his birth family, and that he will grow up not just knowing them, but calling them family. A lot of people have told me they are in awe of myrelationship with Payton. Some have even said they would not be able to sharetheir child in the way that we do. But Milo belongs to both of us…I am hismother and she is his birth mother. His family circle is wider than most, butit is overflowing with love. As a parent, you always put the needs of your children first. I know without a doubt in my mind that Milo needs his birth family just as much as he needs us. And I am confident that as he grows, his understanding of where he comes from will be easier to process because he has his birth family. There will definitely be a lot of bumps in the road and we will take each in stride, but we will do it hand in hand with his birth family. The day had finally arrived. After home visits, sleepless nights, lots of paperwork and a whole lot of blow outs, we get to officially become a family. I woke up on Tuesday morning not really knowing how I felt. It had been such a journey to this day and it almost felt unreal. I put on my favorite playlist as I started getting ready for the hearing. As soon as Milo's adoption song came on, I broke down into big ol embarrassing sobs. A year of negative pregnancy tests, 4 years of paperwork and putting ourselves out there only to be rejected by expectant mother, 3 agencies, so much waiting and heartbreak...all of those feelings came flooding in. But this time, instead of feeling immense pain and despair, I felt overwhelming joy. Milo had changed everything. That morning I hugged him harder, spent more time just sitting with him and soaked up every laugh and smile. We left ridiculously early for the courthouse because it was snowing and I have a terrible reputation for always being late. The whole drive down we barely spoke...and I could not help but break down into tears off and on for that entire drive. We arrived at the courthouse and after speaking to multiple clerks, we found our courtroom. 1R...the same dorm number I lived in my first year of college. We sat outside of the courtroom and waited for our family and friends to arrive. Finally it was 11am and time for all of us to enter the courtroom for our hearing. We sat down with our social worker, with everyone in the row behind us. Our judge walked in and totally set the tone for the proceedings. He had adopted both of his sons and made us feel at ease with his kind nature and in sharing his story. He walked us through how the proceeding would go and then started the hearing. We did not even make it 5 minutes before Milo peed through his entire outfit. We had to take a brief recess and it was all hands on deck to get him changed and cleaned. Looking back now, that embarrassing start allowed us all to relax and laugh. It was the perfect start to our hearing. The judge started by questioning our social worker....was Milo a good subject for adoption? Did we meet his needs...financially, emotionally, and physically? She responded adamantly YES! The judge then questioned me. I raised my right hand (shaking to my core) and swore to tell the whole truth and nothing but the truth. He asked me if I was willing to look after Milo, provide for his needs and be his mother indefinitely. He asked me when I first met Milo, what I loved about him, and why I wanted to be his mother. He asked me if Milo had been to all of his scheduled doctor's visits and received the care he needs to thrive. He also told me that this adoption would be permanent, and joked that when Milo was a teenager, I could not take it back. After my questioning was over, the judge made Will swear under oath and answer the same questions. He did so proudly and with amazing confidence. I looked at Will and knew that Milo has the most amazing dad. I know that Milo will grow up to be just like him. After all the questioning, the judge decreed us Milo's legal parents. He looked right at me and told me from here on out, you will forever belong to him. For the first time in almost a year, I felt like I could finally breathe. From the moment we matched, up until we finalized, I had been holding my breath. Even though Milo's birth mom chose us, even after seeing me at my most vulnerable through my blog, I was so terrified she might find some reason to change her mind. When we met in person, I worried that I would say something weird or crazy and make her change her mind about us. At the hospital, even though she was confident in her decision to place Milo with us, I was terrified she would change her mind. When we brought Milo home, I was worried that I would never measure up to the honor of being his mother. Just like most first-time mothers, I questioned everything....was he gaining enough weight...was he sleeping enough...why was he upset? I was worried about sharing too much or saying something that might offend or make me look like a sleep-deprived crazy person. So each week and month passed and I was still holding my breath. We had our post-placement visits from our social worker, we filled out reports on his health and development, and waited for our paperwork to be accepted by our judge. Our paperwork was rejected by the judge three times which was so nerve-wracking. It was nothing to do with us as parents but all to do with the fact that Milo was born in Utah and we were finalizing in Colorado. Each state has different laws and procedures when it comes to adoption, and our state is the strictest. Our judge was very thorough and now I am extremely grateful. He is a man of great integrity, who has adopted both of his sons, and can say with complete confidence that our adoption of Milo is forever. Nothing can overturn it or change who we are now...his parents. We are so incredibly grateful to our family and friends (near and far) who have walked alongside us in our journey to parenthood. We have been truly blessed with a community who have supported us, prayed for us, showed up fiercely for us and encouraged us. They are the people who did not let us give up hope, who have reassured us when we felt unworthy, and who love Milo unconditionally. I could not be the mother and wife that I am today without these people. This journey has been one of the hardest, but it has been the absolute best. It has brought the most wonderful people into our lives. People who understand the heartbreaking struggle of infertility and the absolute joy that is in adoption. We are so thankful to God for his faithfulness and for the joy that we now get to experience as Milo's parents. Milo Payton, we are so honored to call you our son. Ithas almost been a year since we were first introduced to the agency and theexpectant mother that would change our lives completely. February26, 2018, we were contacted by a friend about a potential situation. It was outof agency, out of state, and completely out of our control. Three days later, after anxiouslycorresponding with Payton (the expectant mother) and getting to know herbetter, she decided to choose us! Then began the waiting game for Baby M to beborn. I remember those two months like they were yesterday. I was so excited for him to be born and so terrified that she would change her mind. I remember thinking how we had waited for him for so long (over 5 years) and how each day leading up to his due date felt like forever. Despiteall of my planning and preparing, Milo made his grand entrance into the world amonth early. Eight months later and he is still doing things in his own timeand on his own terms. The whole time we waited to become parents we imagined our future child. We pictured who they would be and all the things we would do as a family. Nothing could have prepared us for the joy that is Milo. He is better than anything we could have hoped for or imagined. We thank God for him every single day. Nothing about our journey to parenthood has been easy or direct. Infertility almost destroyed our marriage and the long wait to adopt almost destroyed us personally. But I would not change a thing because it brought us to Payton. I still am in awe of her bravery and her love for Milo. Our relationship with Payton and her family has been the biggest surprise and the biggest blessing. We had no idea how much of a bond we would feel with Milo’s birth family. We are so thankful that she changed her mind and chose an open adoption with us. She encourages me daily and it is an absolute joy to share pictures and videos with her. Open adoption is a beautiful thing. Milo is so incredibly loved. So how can I sum up the last 8 months, well really the last 5 years. We started this journey full of hope and completely naïve. We assumed we would match quickly and become parents, despite the statistics and long agency waiting lists. We had no idea how long the entire process would take. Forthe most part we remained optimistic, even after the first agency ended upbeing a complete waste of our time and money. After months with the second agency and multiple rejections fromexpectant mothers, we started to loose hope. We survived each holiday thinking it would be the last one we would experience childless. We watched all of our friends get pregnant and start their families. We ignored all the unwarranted advice and suggestions from naysayers. We focused on building our home, adventuring to new places and spending intentional time together. Our home and our hearts were ready, we just had no idea who we were waiting for. All of the paperwork, the waiting, the longing, the rejection, the brokenness and despair were completely worth it. I can look back now and see how God was preparing our hearts for Milo. He had chosen Milo for us and I would do it all over again just to be his mother. Andnow here we are…8 months later and we get to officially call him our own.Social worker visits, court ordered documents, judge approved paperwork, andall the hurdles have been completed. We will sit in that courtroom with our sonand legally promise to care for him (physically and emotionally) for as long ashe needs. The honor and the responsibility are not lost on me. Finalizing Milo’s adoption feels like the culmination of our adoption journey, but really it is only the beginning. One signature cannot capture a lifetime of parenthood. Its in the big and the little things of life….the nighttime feedings and the first steps, packing lunches and learning to read, the conversations and the heartbreaks, the comforting and the celebrating, the hugs and the goodbye waves, the school dances and the college essays. We get the honor and responsibility of raising him, of shaping him, providing for all his needs, and most importantly, loving him. We get the opportunity to declare in front of our family and the judge all the promises we have made from the moment we said yes. Milo, we will be there for the ups and the downs, the firsts and the lasts, the trials and the triumphs. We will hold you when you cry, help you get back on your feet when you fall, and guide you as you grow. We will share all of the things: laughter, adventures, rugby, french fries, and a love for DIY. We love you to the moon and back , Milo Payton, and we are so thrilled to officially call you our son. When we started this whole adoption process five years ago, we were naive, excited and so optimistic. We started researching agencies and began narrowing down which avenue of adoption we were able to pursue. We knew it was not going to be an easy journey, but the hardships we faced still knocked us off our feet. A lot of heartache, rejection, 5 years and 3 agencies later we have our son, who was completely worth the wait. As you all know, we decided to adopt privately, through an infant domestic program. They educated us on the realities of adoption today, and helped us make a realistic plan in regards to exposure and openness with the birth family. We were told that most women who make an adoption plan for their baby do so because they are struggling with a certain vice, whether it be addiction, homelessness, a violent relationship or incarceration. We were also told to manage our expectations on the level of openness we would have with the birth family, and not to move forward with a situation unless we were comfortable. Will and I talked through different scenarios and prayed that we would be matched with an expectant mother who wanted somewhat of an open adoption. Honestly we wanted a relationship with her that was within our own set of boundaries. Payton and I started emailing in March after our agency put us in contact. I was so incredibly nervous that I would say the wrong thing or that she would find a reason to not choose us. It had been almost a year since we became active with our agency, and we had come in "second place" 4 times already with expectant mothers. We exchanged photos and shared a bit about our lives. We found out in just a few emails back and forth that we had a lot in common. That afternoon the agency called us to say we were matched. From then on out I mainly emailed with Payton's mom, who shared more of Payton's life with me as the entire situation was really hard for her. I remember checking my email like crazy and weighing everything I said in response. God used those emails to bond us together as family. As you all know, Payton wanted a closed adoption when we matched. She then decided she wanted to meet us and shared her desire to have a semi-open adoption. After Milo was born, our social worker told us that she wanted updates through social media and a visit once a year around his birthday. We had been praying for this (with the utmost respect for her wishes) because we knew Milo would benefit from a relationship with his birth mom. But I also realized that one visit a year would not allow them to truly know each other. So we went out to Utah. To say I was terrified would be an understatement. I knew it was the right thing to do, for Milo and Payton, but I was so unsure of how the visit would go. Walking up to her parents house that Saturday morning, I was so nervous I could have puked. We walked into the apartment and saw everyone sitting around the coffee table. Payton's face immediately filled with joy when she saw us and it filled my heart with peace. We all sat down and visited for hours and the awkwardness disappeared. Payton held Milo, fed him and rocked him to sleep. We went to the park, just the four of us, and Payton walked us down the main street in her town. Her mom picked us up and showed us where they went to school, where they were building there new home, and all the cute neighboring Swiss town. I don't remember a lot of details from that first day or even what we really talked about. I just remember how easy it was to talk to her and her family, and how much love and care they all have for Milo. We went out for dinner that evening with Payton and her boyfriend, Simon. Milo puked all over both of them, which is his biggest sign of affection. We learned more and more about Payton and our love for her grew. We spent the rest of the weekend visiting with Payton and her family. On our last day, we took Payton out for lunch and talked about her plans for college. This is a girl whose whole life got turned upside down because of an unplanned pregnancy. She made the hardest decision and chose to make an adoption plan for him, putting her wants and needs behind his. She is incredibly selfless and brave and wants to change the world. I could not be more proud of her, not just as Milo's birth mom, but as the women she is becoming. We prepared ourselves to be matched with a birth mom(family) that would either not want a relationship with us, or that would have something in her life that hindered any sort of relationship with us. God matched us with Payton, and no other birth mom could ever compare. We had no idea how much love and admiration we would feel for her. She is someone I completely admire and respect. She is the reason Will and I are parents. Today, Payton, on your birthday, as you start another year, we hope you celebrate all you have accomplished so far. We hope you continue to live boldly, and that you fiercely own your story, because it is beautiful redemption. Work hard at what you want to achieve and dream big. The three of us will always be here, cheering you on. We love you and are so thankful to call you family. Milo Payton // What's in a name? It’s been over six months since our sweet Milo was born. I cannot believe still have much he has grown and all the new things he can do. This age is equally exciting and exhausting for all three of us. Eating solids and learning to roll over have been the big highlights. He is such a happy baby (until he is hungry or tired or bored) and we love him so incredibly much. Most of you know that during our adoption journey we called our future baby, Baby M. It would have made sense to call him Baby P(eck), but honestly I did not know that was a thing. We chose ‘Baby M’ because both of our baby names (boy/girl) begin with the letter M. It was easier for me to picture and pray for our future baby by giving them a name. 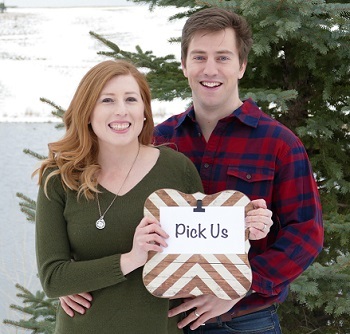 We were not sure at the time whether we would be chosen for a baby boy or girl. So Baby M became the name. Naming our future child was so important to us. I already was not going to be able to create, carry and birth our child. I did not want to loose another part of motherhood and prayed desperately that our birth mom would allow us that honor. As many of you know, Milo’s birth mom wanted a closed adoption when she chose us. While we were hopeful that she would one day want a relationship with him, we were given the right of naming from the start. I, however, was still terrified of sharing his name. I knew that if she did not like it, then it would be hard to name him Milo. Up until Milo’s birth, my communication with his birth mom had been through her mother. I shared his name finally when she asked through email. I was so relieved that they loved the name. Now we had to figure out what his middle name would be. I had my short list of names but they all felt wrong. I spent hours looking up middle names that would work well with “Milo” and even thought maybe our original name just would no longer work. And then on a forum I saw someone suggest the name Milo Payton. I knew then that this would be his name. If you know us well and have spoken to me in person, you will know why this name is so special and so significant. I shared my feelings about the name with Will, who then shared that he had been thinking the same thing all along. Payton had to be the middle name. This past weekend we went to Utah to visit Milo’s birth mom and her family. Over the past 6 months, both Will and I felt like one visit a year would not be enough for Milo to have a relationship with her. We asked her if she would be willing to see us more, and she said that she had wanted more visits but did not know how to ask. God was stirring this in all of our hearts, and so we planned a trip on Thanksgiving weekend. We have not shared personal details, pictures and names on social media to respect Milo’s birth mom’s privacy. This trip was so significant because we grew closer to Milo’s birth family and his birth mom is finally sharing her beautiful story. This means, with her blessing, we are now able to share her with you all too. Payton is one of the bravest and most selfless people I have the privilege of knowing and now calling family. She is the reason I get to call myself “mom”. We chose to name Milo after his birth mom because we have the greatest amount of respect and love for her. We want Milo to always know where he came from, and to not doubt for a second that he is so incredibly loved by her. When we met Payton and her mom for the first time (two weeks before Milo was born), we were terrified. Terrified she would change her mind about us, and terrified that, knowing she wanted a closed adoption, that she would not be okay with us choosing Payton as his middle name. Obviously you know that neither of those fears became realities. She loved that we wanted to use her name, especially since she was so worried he would hate her one day for her decision to place him for adoption. She had also decided that she wanted a semi-open adoption, and we were really excited and hopeful for that. These past six months, I have shared pictures, videos and updates with her. Payton and I text almost daily and I love that I get to share Milo growing up with her. She has encouraged me and affirmed me as a mother. When I find things hard or think I’m failing as a mother, she responds with grace and kindness. I cannot wait to share this past weekend with you all. I am in awe by how God has redeemed both our stories and is shaping this journey for us. We are so excited that Milo gets to grow up with two families who love him more than anything. September 14, 2018 - Milo is officially 4 months old and I am finally taking some time to reflect over the past four months. I also thought it was about time I shared our adorable photos from his newborn shoot. Parenthood has rocked my world in the best possible way. Everyone tells you before you become a parent that sleep becomes a long lost friend and your time with your spouse will never be the same. No advice or planning can fully prepare you for those two realities. Milo was born a month before his due date, and even though he was healthy and strong, it added some complications to the start of his life. His fast arrival meant that he still had amniotic fluid in his lungs, which impacted his breathing and his ability to eat. On the second night in the hospital, he had his stomach pumped and spent quite a few hours in the nursery with our amazing night nurse. My anxiety was through the roof. I was so worried about him that I couldn't sleep the entire time he was in the nursery. Our first night out of the hospital, Will stayed up with him the entire night and let me sleep. He held him, and fed him and burped him. He did not sleep because we were so worried about Milo spitting up and choking. Every time we put him down, he would start grunting and would throw up. I slept for about 6 hours and then took over and let Will sleep. We should of known then how little sleep we would get over the next two months. At Milo's two week check up the doctor diagnosed him with reflux. We had to keep him elevated for 30 minutes after each feed and only feed him one ounce at a time between burping. He had to sleep in a Rock N Play which we put in a Pack 'n Play to protect him from dog sniffs and licks. For the first month he slept in our room right next to our bed. I would wake up spontaneously throughout the night for the first three weeks and would check multiple times to make sure he was breathing. That happened less and less the older he got. After a month of him in our room waking up every 30-60 minutes to eat and grunting loudly the rest of the time, we decided to move him into his nursery. Since he was born premature and still only a month old, we made up the futon and I decided to try sleeping in there for a week. Milo was still waking up so many times at night and would struggle to fall asleep. Those nights were a complete blur and most days I spent in my pajamas, covered in throw up, holding him. He would really only sleep during the day if I rocked him to sleep and held him. I watched a lot of netflix but was so anxious that I could not sleep. We then decided at 6 weeks to try adding formula to his bottles of breast milk. BIG MISTAKE! His little premie body could not digest the formula and the gas from it made him scream all night. We decided that we would stick with the breast milk and drop any expectations that he would start sleeping longer. Just before his two month check up, I called the doctor about reflux medicine. Milo was growing really well and was on track, so he had not prescribed the medicine at the previous appointment. But Milo was grunting and in so much discomfort and I knew the medicine would help. Will and I also decided to start alternating nights with sleeping in the nursery. I was having a really hard time doing every single night feed and taking care of him during the day. So we took turns. Every other night one of us would sleep in the nursery and do all the night feeds. The other would then get a recovery night to sleep on their own. It helped us get more rest and a little more sanity. When we travelled to California when Milo was two months old, something switched. Milo started sleeping up to 5 hours at night. We had moved him from the Rock N Play at 2 months and started using the Dock A Tot. We still had to keep him elevated after he eats and on an incline when he sleeps, but we noticed his throwing up had significantly decreased and he was sleeping longer stretches. We swaddled him in a Halo sleep sack, but he insisted on having his arms up, so we only would swaddle his waist. We got a little bit confident and started introducing formula again. At three months he was sleeping 6-8 hours at night and was climbing up the growth chart like a champ. The formula definitely helped him sleep longer, but it also made him puke a lot. We also realized that Milo needed to nap more during the day and we started introducing a routine. Today, Milo is officially 4 months old. He is sleeping 12 hours at night, with one dream feed, and is taking 3-4 naps during the day. He is eating less milk (and not throwing up hardly at all) and is overall a rested and happy baby. He has totally found his voice with cooing and talking but also screaming when he is hungry or tired. He laughs when we tickle him and he smiles back at us non-stop. He loves to grab onto things and play with them and is constantly chomping on his hand. He is always kicking his legs and loves to sleep cuddled up with his giraffe pacifier 'Ginny'. For Will and I, parenthood has shifted our priorities. We have traded in spontaneous trips to the movie theater and sleeping in on the weekends for naptime routines and diaper changes. We are more intentional with our time, because its limited. Our days look different then before, but we still make time for date nights and we are more of a team than ever before. I could not be the mother I am without Will, and I know he would the same about me. Our priorities have shifted for the better. Milo not only has made us parents, he has made us better spouses to each other. We might have had a rough start to parenthood, but every single second has been worth it because of Milo. This is a story I have been longing to write since we first started this whole adoption journey. This is the story about the birth of our son…OUR SON! I am still pinching myself that we have a SON! If you have seen us in the last 2 months, or you know my mom, then this will be old news for you. It starts with Mother’s Day…Mother’s Day, for me, was different this year. As I shared in my last blog post, the past couple of Mother’s Days had been a reminder of what we were still missing as a family. This year, I had hope. Although I technically wasn’t a mother (yet) we were waiting for the birth of our son who would become ours through adoption. He was due on June 12, and the induction date was planned for June 5. I had a countdown on my phone that I checked every single day. I went over how many work days I had left until summer and how many days of summer I had until the induction date. Mother’s Day weekend, we bought a little suitcase for all of Baby M’s clothes and things. Will thought I was being a little bit ridiculous in packing Baby M’s suitcase over a month early, but he knew it was all a part of my nesting process. We spent Saturday cleaning the house, like really cleaning the house. We had gotten swept up on the busyness of life since we matched and had neglected a lot of things around the house. Sunday rolled around. Like I said, it was the first Mother’s Day that I truly had hope of becoming a mother. I thought about our expectant mom (what they call the birth mother before they give birth) all morning. I wanted to email her but I did not know if she wanted to hear from me. We had met her and her mom the weekend before and it was wonderful. But over the last two months, I really had only been speaking to her mom. She, at that time, wanted a closed adoption. So I had emotionally started preparing for what that would mean for us. I wanted to respect her wishes, but I was devastated at the thought of having to share that with Baby M one day.After we met, she shared with her social worker that she wanted a semi-open adoption. Will and I were so excited! So on Mother’s Day I sat down to write her an email…only to find that she had already emailed me.Through the biggest tears, I read the email out loud to Will and my mom. In her email, she shared her journey from finding out she was pregnant to deciding to place him through adoption to choosing us as the adoptive parents. Up until that email, I had only heard her story and known her through her mother. The email affirmed how much she wanted us to parent her son and also how much this baby had changed her life. All I had wanted was to know her, know the woman who would make me a mother. Thinking about that email, I have tears in my eyes now. Her and I are bonded in a way that is almost indescribable. It’s a bond that only adoptive and birth moms share.The next morning I woke up to a missed call and a message…her water broke. She was 35 weeks and 6 days along, so they transferred her to a bigger hospital in Provo, UT. We looked up flights, but there were none (later we found out that most of Southwest planes in Denver had been damaged by a hail storm!). So I called my dad who came and got the dogs, we packed up the car, and drove as fast we could (legally and safely) to Provo. It took us just under 8 hours to get there, and the entire time I just prayed that we would get there in time! At 3:30 we got an update that she was fully dilated, but that the baby had not fully descended. They were going to let her rest for an hour and then she would start pushing. We arrived at the hospital at 4:00 pm. We got to the delivery floor and were greeted by her mom. I was barely holding it all together. We went into the delivery room and met some of her family. Everyone placed bets on the baby’s weight and delivery time. At 4:30 Will and her brother left to go sit in the waiting room. It was time for Baby M to be born.When it was time for Baby M to be born, I was a total wreck. I might have looked completely composed on the outside, but inside I was totally freaking out. I knew that it would only be a matter of minutes before he made his entrance into the world. All of my planning could not have prepared me for that moment. I stood on the side of the bed, as Baby M’s birth mom got ready to start pushing. I stood next to her mom, who had previously worked as a Labor and Delivery Nurse. She coached everyone through what needed to happen, even the nurses who were working. They told her how to breathe and push during each contraction and what it would feel like. I stood there not knowing what to say or do. I was completely out of my depth and was so incredibly grateful that her mom was there to guide her. Two contractions and pushes later, Baby M made his first appearance. The nurse ran to get the doctor (Dr. Bennett) who barely got her gloves on in time to catch Baby M. Milo Payton was born at 4:48, on May 14, weighing 6 lbs 1 oz and measuring 17.5 inches. It can take just one moment…one beautiful, breathtaking moment, to change your life forever. I stood there for those first few minutes while they checked and measured him, feeling like my heart could burst into a thousand pieces. Because he was grunting instead of crying, they sent us both to the NICU. The doctor their gave him some sugar water and sent him back. He was 4 weeks early, so they were taking every precaution. We went back to the delivery room and I called Will to come and meet his son. Seeing Will hold Milo for the first time calmed my nerves completely. There is nothing better than seeing the man that you have chosen to walk through life become a Dad. We stayed into the delivery room until they had Milo’s birth mom’s room ready. I would like to say I remember what we all said during that time, but its all completely a blur. It felt like home being with her and her family, sharing that time with Milo. We all walked down to the room that his birth mom would be staying in with Milo for that first night. Her mom left to get some food for us (Chick-Fil-A) and we all settled in for the evening. We each took turns feeding, holding, swaddling, and changing his diapers. We watched criminal minds while we ate our food together and talked about everything and anything. Our plan was to stay for his first bath, but by 11pm, we decided to let her and Milo rest. We left the hospital for the night and went to our Air BnB. The next morning we waited until she was awake and ready for us. I was very aware of how the time in the hospital belonged to her and Milo and I didn’t want to take away from that. We headed over late that morning and spent some time with them in the hospital room. Milo had his first bath and his cries had both me and his birth mom in tears. We both hated seeing him upset. Will and I went to grab lunch and I called our social worker. She said that Milo’s birth mom had decided she wanted an open adoption with updates and a potential yearly visit. I was so excited that she wanted to know Milo growing up in person, not just through updates. It was the best news we received that day. The social worker also told us that we would need to leave the hospital around 3pm before her caseworker would arrive at 5pm for paperwork.I went back to the room knowing what this day would mean for her. She immediately handed me Milo and my heart broke. Milo was the best thing I had ever held, and she was choosing him completely over herself. The love that she has for Milo is completely unmatched. No one will ever love him like she does. Before he was born, the reality of what adoption means for Will and I was just an idea. Now, as I was holding him, I could see and feel what she was giving to us. I knew in my heart that she would stay true to her plan to place him with us. Part of me was devastated for her. But part of me, the part that looked at him and saw how amazing and wonderful he was, that part was terrified. I handed Milo back to her and her mom, who were both sitting in the hospital bed, and we began to collect our things. I looked over at them and they were sitting there staring at him, with tears pouring down their faces. We said our goodbyes and they hugged us and thanked us for loving Milo and everything we would do for him. It took everything in me not to break down completely. We headed back to our Air Bnb and I lost it. The happiest day in my life was also one of the worst because I knew how hard this decision was for her, a decision I so desperately wanted her to make. But at the same time, my love for her and her mom was so big, that my heart broke completely for them. She made the ultimate sacrifice so that I could have the biggest blessing. Those two hours were the hardest emotionally for me. The smallest fear that she would change her mind, and the biggest heartache for her if she didn’t.Our social worker called us when she was done with her paperwork. We went back to the hospital to sign our placement papers. We were having a hard time figuring out where we were going to stay that night as our birth mom was leaving and Milo had to stay in the hospital another night. We only had one bracelet that would allow me into the nursery so I would have to spend our first night as official parents away from Will. Our social worker fought for us and we were able to get a room down the hall in the children’s ward. It was now time to say our goodbyes (again) and officially start caring for our baby boy. I was so happy to see his birth mom smiling and holding Milo as we walked in. She handed him over to me and we hugged. We thanked each other, cried some more, and then she left.As I am sitting here writing this, all of the feelings and emotions of that day come rushing back. Our greatest joy is that precious little boy. But I am and always will be a better mom because of his first mom…the woman who gave him life and chose a better life for him. I feel the weight of that choice every day, and it motivates me to be the best mom for sweet little Milo. The road to Milo was longer than we anticipated, and it was filled with terrible hardship and disappointment. But that road, as difficult as it was to walk, led us to him. Milo Payton, you are so incredibly loved. 9 years ago, in February, Will and I went on our first date. Well it was our first "official" date...we had gone to a rugby game together and I had made him terrible pesto pasta with carrots. Our first official date Will bought tickets to Chicago the Musical. He showed up at my door dressed in a suit with flowers in hand. I was so incredibly nervous (but not as nervous as Will). We arrived at the theater and I asked if Will knew anything about the show. He didn't. I then explained that it was a musical about women who sang about killing their husbands/partners all whilst wearing lingerie. He was so embarrassed and tried to cover my eyes anytime there was a slightly salacious scene. It was one of the best dates he has ever taken me on...and has ignited our love for the theater. That same night I shared with Will how I would one day grow my family through adoption. I have always worn my heart on my sleeve, and I felt so strongly about adoption that I did not want to waste my time with a man who did not share that same calling. Will had honestly never thought about adoption, but he knew he wanted to be a dad one day and that he was open to that. We dated for the next 2 months...Will was the perfect gentleman. He opened doors for me, walked on the side of the pavement that was closest to the cars, and even asked my permission before he hugged me the first time. We spent all of our spare time together...talking and sharing and laughing and watching rugby and Lord of the Rings. I knew I was in love with him when we were in a department store and I was looking at baby clothes. I knew there and then that Will would be the father of my children. It hit me so hard and so fast. I could not imagine doing life with anyone else. Most of you know that parenthood did not happen exactly like we planned. We tried for over a year to get pregnant and for whatever reason we never got pregnant. We knew adoption would be a part of our story, but we did not know it would be intertwined with the struggles of infertility. So when we were ready, we pursued adoption. We got to a point after the first agency ended up being a scam and waste of a year, that we felt utterly hopeless. I felt the weight of providing a child for Will and the reality that it just was not happening. One night we spoke frankly with one another...about the life we had been blessed with...our jobs, our families, our home, our pups, and each other...and we made a promise to each other. If parenthood was not a part of our story, we would be ok. We would rejoice in the lives we had been given and we would be content. I looked at Will with our nephews, how he longed to be a dad, and it broke my heart. I knew how badly I wanted to be a mom, but I could see how our waiting and struggles were affecting Will. He was the strong one...the one who picked me up every time we had a negative pregnancy test, or we weren't chosen for a baby. He was and still is my rock, the strongest man I have ever known. But I could see how much he was hurting. He would talk about waking up early on a Saturday to watch rugby with our child. How he would sign up to coach their little league teams, take them camping, and be their scout leader. He didn't experience the physical loss and grief of infertility that I felt every single month. But he felt it nonetheless. I knew I could eventually cope with not being a mother, but it killed me thinking that Will could be robbed of parenthood. It's Father's Day tomorrow and I am so excited to celebrate Will. From the moment we matched to now, Will has showed up for Milo in more ways than I could have imagined. I always pictured Will with our future kid, but the reality is so much sweeter. He loves on that boy like no other Dad. Our first night out of the hospital, Will stayed up the entire night holding Milo because his reflux was so bad and he couldn't lay down flat without throwing up. He let me sleep for 6 hours so that I would be rested for the next day. He changes diapers without hesitation, he makes bottles and feeds Milo every night at 2am. He walks in the door from work and instantly wants to hold our son. I thought I loved my husband so completely...but there is nothing more wonderful than seeing your husband care so incredibly deeply for your child. The love I have for Will has grown and changed because of his love for Milo. I am sitting here in tears because I know Milo is growing up with the best Dad. Will is going to show up for that kid always. He will be at sporting practices and games, at school events and plays, at doctor's appointments and parent-teacher conferences. He is going to share his Dad-jokes, embarrass him, and teach Milo everything he loves about the world. I am only the mother than I am because of Will. I know that God prepared us for one another...that we would need to lean on one another through the hardships. He also prepared sweet Milo to be our son. When I am doubting who I am as a mother, I can look to Will and be reminded of God's provision and unending goodness. Sharing our story has been both therapeutic and exhausting. Each stage of this journey I have been trying to guard my heart and not let fear or anxiety take root. Writing this blog, for me, has been a way to chronicle our adoption journey and to process all the ups and downs. Sharing all our "no's" has not been easy...but I am looking forward to sharing that one "yes! "About two weeks after our last "maybe" situation, we got another call. This time the expectant mom was due in March and had a medical health history that made it a risky situation. We also were told that the baby was a boy! We weighed up all the risks and decided to put our book forward. They delayed showing the books one week and then delayed it another week. We were three weeks into waiting when we found out she chose a different couple.I spent those three weeks waiting taking all of the baby girl clothes out of the nursery and filling the drawers and closet with little baby boy clothes. I had pictured our baby being a girl since our first "maybe" situation back in September. I honestly had to come to terms with potentially adopting a baby boy. Will was thrilled at the idea of adopting a boy (he has wanted a boy this entire time! ), but I, without realizing, had pictured Baby M as a girl. I was anxious during the entire wait...I kept checking my phone and email hoping for an update! When we got the email that we weren't the chosen family, I honestly expected to react in a similar way to our previous situations. This time was different. I was not sad, just more relieved. I knew fully that this little boy was not meant to be ours. For the first time I was completely letting go of control and trusting that our baby would come to us. It was such a new feeling for me...and finally giving up the control and trusting God completely gave me so much peace. A friend of ours, who has adopted multiple times, texted me on Monday, February 26, about a potential situation. This expectant mom was out-of-state, and in a completely different agency than ours. She was looking for an attractive, young, out-of-state couple who did not have kids but loved dogs. This expectant mom had exhausted her agency's database and could not find a family to match with. I told him the financial reality attached with this situation (we are currently locked into a contract with our agency and would be responsible for paying two agencies) and he immediately said no way! I asked him to take a moment, think and pray, before he decided no!I called to find out more information about the situation. The baby boy would be born in June and the expectant mom was young and wanted him to have two parents! We decided to call our agency to get a clear picture of what this situation would cost us financially. After that phone call I broke down and cried...Will would never agree to it. Little did I know... During that conference call, Will had been taking notes and figuring out what we would need to borrow and raise if we were chosen. He called me and went over all the numbers. He was excited and we both decided to move forward and have our book shown.Well after two days we found out that the expectant mom wanted to email us first before she made any decisions. I was really excited about this because I had no contact or closure with any of the expectant mothers that did not choose us in the past. Her mother sent me a beautiful email about her and her situation. We responded with questions about her and shared a bit more about us. On Thursday, the expectant mom started emailing me. It was lite and conversational in style and I kept it focused on her. She started sending me pictures of her dogs, her siblings, and herself. I was so excited to just talk to her and to get to know her. We have a lot of things in common, but it was also nerve-wracking! I decided to be myself with her and realized that if her baby was meant for us, me being my normal chatty self couldn't change that!She emailed me to say that she enjoyed talking to me but had to go. I texted the caseworker to let her know we had been emailing and she asked if she could call me in an hour. I was driving to my physical therapist appointment when she called... She asked how the conversation went with the expectant mom and I shared all of the connections with her. She then told me that the expectant mom had called her an hour earlier to say that she loves us and wants to match with us. I immediately starting weeping (luckily I was already parked!) and could not believe it! In all the previous situations, I had been desperately waiting for that call. This time it took me by surprise. The case worker said she gave the expectant mom the weekend to decide, but she was adamant that we were the family she had been searching for. I called Will to tell him the news and we cried together for what felt like forever. I quickly ran into my appointment, told them I was emotionally unavailable, and then drove home. I have often thought about what our "yes" would feel like. It has hit me in waves...where I cry uncontrollably and then experience so much joy and excitement. We had no idea that this baby was going to be ours and now we just can't wait to meet him. Its officially been a week since we matched with our expectant mom. Will and I still look at each other and get giddy! I know now that our last "maybe" prepared our hearts for this boy. He is already so loved! We are overwhelmed at God's goodness and faithfulness to us. As we are adopting out of state, the total cost of this adoption is more than we had originally budgeted for. We are excited to start fundraising to help with that financial burden. We have set up a gofundme.com page and will be doing various fundraisers up until June. Thank you so much for your support over this long journey to find our Baby M. We appreciate your prayers, you conversations, and your support. I wrote about our "almost adoption situation" that happened back in September. Well it happened again...so I thought I would share our experience.Christmas was beautifully busy! We had Will's oldest brother, his wife, and two sons visit us for 2 weeks over Christmas and New Years. Our nephews are 4 and 16 months old and we jumped right in with reading stories, building legos, singing the same song 345,693 times, and just having an absolute blast! Our house was boisterous, loud, and full of joy! After living for 6 years with just the two of us...we got to experience how full our life could be with children. After those two weeks, they returned to England. Our house was quiet and we felt their departure in more ways than one.Those two weeks showed us the ups and downs of parenthood. Our time spent with our nephews was exciting and exhausting...happy and hard. Parenthood is not all rainbows and roses...its hard work. What we learned was that even when it is hard, those cheeky little smiles and their endearing hearts make it all worth it! After they left, I emailed our social worker to ask if our book had been looked at by any expectant parents. Our social worker emailed back with a potential situation. This was another crisis situation (where there was little information about the mother and the pregnancy). We had to decide if we wanted our book to be shown. One aspect of the expectant mother's pregnancy fell within one of our "maybe" parameters...something that was not a hard no...but something we needed to discuss first.We decided to move forward and have our book shown. We got excited because there was hardly any alcohol or drug exposure, which is very rare. So we got our hopes up...Well delay after delay after delay...the agency decided the expectant mother was not ready to make an adoption plan and our book was never shown. We still had hope that maybe over the last two weeks before she gave birth that she would change her mind. She never did. We found out on a Monday that they were not going to proceed with an adoption plan with her. I was at work and I was disappointed but dealt with it as I could. I anticipated Will being more emotionally upset because that is what happened last time.What I did not anticipate was the grief that hit me like a semi-truck that evening...For the first time in this entire journey I completely doubted my future of becoming a mother. I listened to that terrible voice that told me "I am not worthy to be a mom...I am broken and will never be able to grow our family." It was a really dark place that I did not even know existed within me. Thank God for my husband and a few girlfriends that I was brave enough to share those deep dark feelings with. They reminded me that I will be a mother...that there is hope...and that I need to trust in a God who is bigger than my circumstances, rejections, and feelings!We survived our second "crisis" situation...both different in experience but same in outcome. I know without a doubt that our baby will come to us...but this waiting has not gotten any easier. The longer we wait, the harder we find this whole process. We look at our home, our capacity to love, and our ability to give a child the best life...and we do not understand why we have not been chosen yet.I keep reminding myself that for us to have our family, another one must be torn apart. That is a reality that will always be apart of our story. When I am angry and sad that we do not have our baby, I have to remind myself that whomever decides to place their baby with us will spend the rest of their life without their child. That is a sacrifice that I could never comprehend or understand. When we look back one day, there will be no doubt about how much this baby was wanted and longed for. People will say that we redeemed our child's story by adopting them, but the truth is...that baby is going to be the one who makes our entire journey through infertility completely worth it. As I reflect over the past year, I see a lot of new beginnings and wonderful memories. My brother got married to his high-school sweetheart and I gained a gorgeous new sister. We got off of the waiting list and were approved with a new agency. Our hearts were so full with all the friends and family that visited. We went to New York and had the chance at seeing our favorite actor perform in an incredible musical. We went on a cruise with 22 of my family members and explored different parts of the Mexican Riviera. But 2017 was also a really hard year. 2017 is the year my marriage almost broke down completely. It is the year my health began to deteriorate again. 2017 is the year we thought we would become parents....really really thought we would! Its also the year that friendships changed and ended and we doubted our place here in this small but growing town. 2017 was the year that my integrity was challenged at work. It was also the year that I felt the most isolated and alone.I was so happy to put 2017 behind me...and naively thought that it would take all of its struggles and hardships with it. But pain does not follow a calendar. And I am finding out that a lot of the issues are still present with me. So to help me process this past year and to bring all of my brokenness out into the light where I can hopefully heal...I am going write.These are the posts I have been avoiding writing. This is me at my most vulnerable and this is me completely broken. Over the next few of weeks I will be sharing a couple of posts about the hardships I have endured over the past year. It is going to be messy and show a part of me that most people have not seen. My hope is that by me sharing my story, it will help someone else be brave in sharing theirs. If this finds you in your brokenness, know that you are not alone and that there is always hope...even when its not visible. Thank you as always for allowing me to be vulnerable. Those first couple of months were incredibly hard. No one wants to know you are adopting...its uncomfortable and a lot of people pity your misfortune. And the longer you wait to adopt, the more they feel sorry for you. Struggling through infertility is incredibly lonely. Waiting to adopt is even lonelier. You watch as all of your friends start having babies. They tell you it won't be long until you have your own. Except it is long. And its unpredictable. And as hard as you try to be present for their struggles and joys of motherhood, it breaks you down bit by bit. You start to hide your heart away, because the less you feel the easier it is to bear. You love the children in your life and you thank God for the blessings he has bestowed upon your friends and family. But your heart hurts. People around you ask about the adoption plans and how its all going. They don't ask about the state of your heart, or your marriage, or how the waiting and disappointment affects both. Honestly, you don't hold it against them. Because infertility and adoption are not the norm. Unless you have experienced either, its not a natural concern. And even when I am at my lowest, and feeling completely and utterly alone, I still have hope. I trust in a God who is bigger than our infertility, who is greater than our longing to be parents. He is working out our story in a way that I can't even fathom. And I am so excited about what he has in store for us.365 days later. Where does that leave us? We are no longer with our agency. We felt that their lack of communication and placements were not something we could endure for another year. We went to a foster information meeting in Adams county, and didn't feel that was our course, yet. So what are our next steps? After researching other local agencies, we decided to go with Lutheran Family Services of Denver. They are transparent with how many adoptions they facilitate annually and do not take on more families than they can support. We are currently on a waiting list with them and are hoping to become active with them in the next couple of months. Our adoption story has not taken an easy or quick course; but we are not giving up. This past year has been hard, but it has also been a part of our story. We still cannot wait to meet Baby M, whenever that is meant to be. A little something I wrote back in November: Spent some time today just sitting in this room...our beautiful nursery. I seem to have avoided this room for the last couple of months. I guess I've been busy, preoccupied with other things, or I have learned to see how full and blessed my life is right now. The longing for our Baby M hasn't subsided, but the feeling that we are lacking, empty, or not whole, has been graciously taken away.When I think about our future child, which is often, I am reminded about how much time we have to prepare for them. This month marks 9 months of being approved and certified to adopt. Most families have 9 months to prepare for their baby's arrival. We have been preparing our hearts and our home for much longer. And every day, week, month and year until we are given Baby M means more time for us to become the people, the parents, God has called us to be. I'm taking this season of waiting that we have been given and am using it to grow as a wife, a friend, a daughter, and a coworker. I'm celebrating all the things we get to do everyday before we become parents. Like sleeping in late on Saturday, spontaneous movie theater dates after work, projects around the house (so many projects) and filling up our time with people and things that we love. I'm working on putting my husband first, before myself, because when we become parents I will be tempted to put him last. And I'm searching for the joy and blessings in everything...taking moments to just sit in grace and gratitude. It’s officially been a year since I started this blog…which means that we have officially been on our adoption journey for more than 365 days. Its been a few months since my last blog post, and I think its time for some real talk... Adoption has been apart of my story for almost a decade. It has been on my heart since I was 16 and I have always known it would be a part of how I grew my family one day. Now that might sound a little cray cray because how can anyone know what the future holds? Well you can call it whatever you want but when it comes to my call to adoption, I have not wavered once. Over the past 365 days I have been blessed with a divine sense of peace about who I will be as a mother and a steady trust in God to provide me with the children I am to care for. Friends have asked me how I am doing with the waiting process, and for the most part I have trusted God’s timing and provision (honestly and truthfully!). But I have only realized recently the walls that I have put up defensively to protect myself. When people question me about adoption, it has been easier to talk about not wanting to get pregnant or do the whole birthing a baby thing. Now while those are true due to my current health and the uncertainty of what daily issues pregnancy could contribute to an already complicated life, I haven’t shared the whole truth with most people. The whole truth is that my husband and I tried and failed to conceive for about a year. This was one of the hardest years of my life and a very trying time for our marriage. Each month I felt like a broken mess that for whatever reason couldn’t do what I was created to do. Not many people know about that year…because it is easier to smile and laugh then it is to cry and weep with those we surround ourselves with. And I am really good at putting up a strong front. Over the past five years we have faced enough pity from those who hear about our plans to adopt. When you throw infertility in to the mix, the responses become unbearable. Infertility is accompanied by shame and disappointment and pity, not just from the couple directly experiencing it, but also from those who are made aware of it. Friends, family, strangers…but most importantly those who are ignorant to the struggles of infertility end up making the most impact with those who are experiencing infertility. I was adamant about this journey of adoption being documented for our future children to read. I want them to know how much they are longed for, wanted and loved. However, I think I have tried to separate our calling to adoption from our struggles with infertility. I wanted our future adopted children to know they were loved and wanted without the messy dialogue that infertility brings. And because of that, I have denied myself of the support I so terribly need. Most of the time I am still trusting in God’s timing and provision. However, there are moments, gut-wrenching and time-stopping moments, where I am floored with the feelings of longing and emptiness. Where I shut down and forget all the ways in which I am blessed. I know deep down that I will make a wonderful mother, if only I were given the chance. I can’t possibly know why my path is different than most. I don’t know why God is making me wait when almost everyone I know doesn’t have to. I am so overjoyed by those I know who are already growing their families. And I trust that those little ones that will be entrusted to us are coming soon…in their own way and in their own time. I look over at my husband…my darling Will. He is patient and kind and so understanding. He has agreed to walk this earth by my side, all the days of our lives. In him I find my support, my encouragement, and my strength to continue this crazy journey we have embarked on. Without him, I could not carry on. So friends, family, strangers…when you hear of someone experiencing infertility…please do not pity them. Do not give them advice on how to conceive (seriously…that happens!!). And when a crazy couple says to you that they are pursuing adoption…don’t tell them they are brave or better than yourself for doing something so uncommon. Don’t separate yourselves from them…rejoice with them…encourage them…pray for them! Don’t complain about your pregnancy when there are those who will never get to experience that miracle. Instead, support them by walking alongside them…by asking the hard questions…by being a shoulder to cry on. Don’t ask them how the waiting is going…ask them how their heart is faring through it all. Understand that every pregnancy and birth they witness is bittersweet. Research shows that 1 in every 8 couples experiences infertility. That means that in every close friendship group, someone is most likely experiencing infertility of some sort. I am that friend. It is time that I own who I am fully. It is time that I embrace the person God has created me to be. I don't know how He will do it, but I know that he will take this brokenness and make it beautiful.